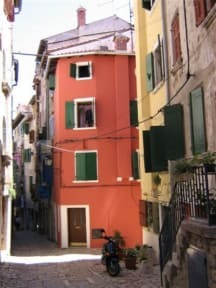 We are a family operated guest house located in the heart of Rovinj. It is believed that Rovinj emerged in the 3rd or 4th centuries. Our guest house is located in the famed old city. Our front door leads you to cobblestone streets lined with restaurants, shops and artists wares. We are minutes away from downtown where you can meet up with your friends at the late renaissance clock tower and decide on what you would like to do for the day. Rovinj is full of possibilities from diving, boating, museum perusing, shopping and our personal favourite, going to the beach where you can sunbathe and take nice refreshing swims in the adriatic. Our rooms are newly renovated and each come equipped with both shower and bathroom facilities. Each room sleeps two people with the option of a cot available. Each room has fridge and portable fan. Great location, and on one of the most photogenic crossroads of old Rovinj. Very quiet except for the occasional person talking below on the streets. Room is small but functional. Windows open for light and fresh air. Fan was a bonus. Bathroom is really small but do-able. Make sure you leave the water heater switch on for future showers (we think we shut it off at one point). Very friendly and nice family host greeted us. Thanks Anita!! Great location right in the old town. The room was nice and clean and the man who runs it is very nice. Only thing it lacks is air conditioning so we had to leave the window open and there was some noise throughout the night. Comfy place to live in. The host is helpful. Room is clean and located in the city. Close to everywhere else! I enjoyed staying here. They family that hosts is very nice and helpful. The room is clean and the the facilities are good except the shower doesn’t get very hot. I might recommend calling ahead if you do not plan on arriving at the arrival time you say when you book, as there is not always staff present. Overall, I had a good stay. Great location in the old part of town. Within a couple minutes walk of everything. 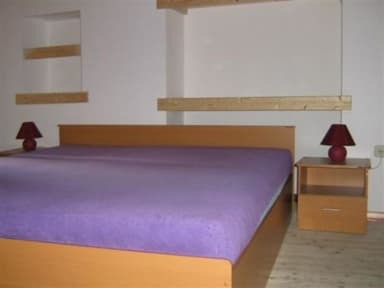 Clean room with nice facilities, kitchen, AC, and clothes washer. Be prepared for steep stairs. We had 4 flights to our room. If you're willing to climb four flights of steep, narrow stairs, it's a great room with en suite. It's the top floor of a family home right in the heart of the old town, not too far from the dock or bus station. Anita, the daughter is super friendly and helpful. There's a supermarket nearby, too, so you can buy food if you don't want to always eat out, however there is no kitchen available, so it would have to be you can't cook.